Baltic Airport Transfers specialise in fast and efficient private transfers from a range of airports to all the major Estonian, Latvian and Lithuanian destinations. By only offering private transfers we guarantee that there will be no waiting for other passengers either at the airport or on the route, enabling us to transport you door to door in the shortest time possible. Far from being an expensive company, our competitively priced private transfers can be as economical as a shared transfer, especially if you are travelling in a larger group. All Baltic Transfers vehicles are driven by one of our professional and friendly drivers who take great pride in their work and in their vehicles. 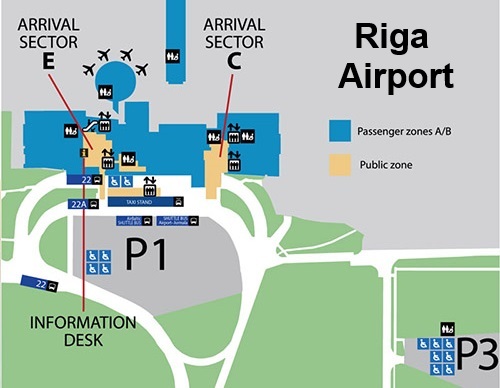 On arrival at the airport, your Baltic Transfers driver will be waiting for you in the arrivals hall with a board displaying your name, please be sure to check each sign carefully! Our office is operating 24 hours a day, 7 days a week, so in the event of a flight delay, please call us on +371 29722770 and we will inform your driver and make any necessary changes. Transfers form Ferry terminals and Bus stations. We also provide transfers from any Ferry, Bus or Train station in Baltics. Most popular stations in Estonia are Tallinn Ferry Terminal, Balti jaam and Tallinn Bus Station. In Latvia - Riga Ferry Terminal, Ventspils Ferry Terminal, Liepaja Ferry Terminal, Riga Central Station and Riga Coach Terminal. In Lithuania - Klaipeda Ferry Terminal, Vilnius Railway Station, Kaunas Railway Station, Vilnius Bus Station and Kaunas Bus Station. If you can not find destination you are interested in, please contact us now for a free, no obligation quote.